The Imperial Yacht Standart was the successor to an impressive line of yachts built for the Russian Imperial Family over the centuries. 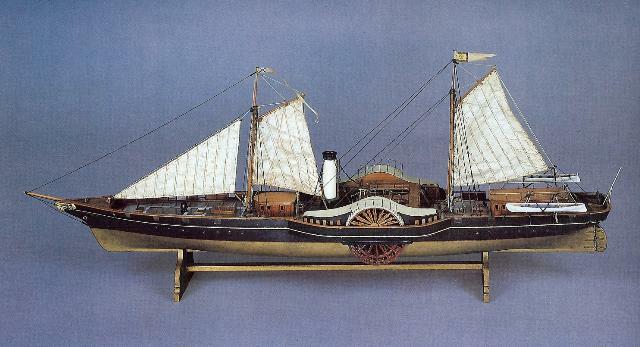 In fact she was the third vessel within the Russian Imperial Navy with the name Standart (her name referring to the banner of the Imperial Russian Family flying on any vessel carrying the Russian Emperor, a picture of which is in the upper left corner); the first Standart was the fregat built for Emperor Peter the Great in 1703, the second Standart was built in 1857 for Emperor Alexander II. Each of the Imperial yachts were obviously among the most luxurious vessels afloat, but on the other hand built according to the latest technology of their time and according to the traditions of the Russian Imperial Navy. When comparing the yachts one another they reflect both increasing technology and respect for the tradition of building yachts to the worlds most influential family. 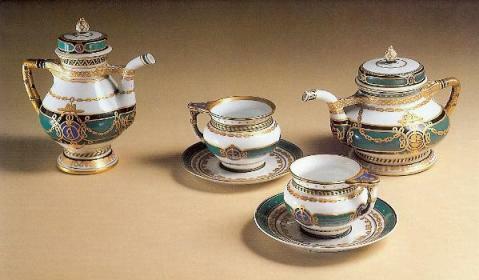 Below a short summary is given of the most important Russian Imperial Yachts and their characteristics. This 55 meter long, 228 ton paddle-wheel steamer was built in England for Emperor Nicholas I in 1851. She continued to serve as an Imperial Yacht during the reigns of Emperor Alexander II, Emperor Alexander III and Emperor Nicholas II. 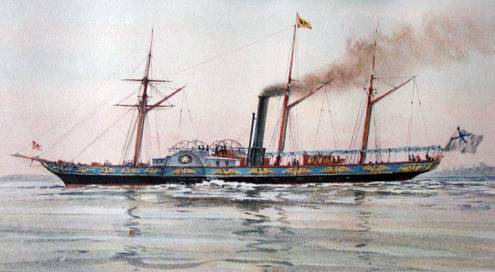 She was decommissioned in 1906 and succeeded by another paddle wheel steamer with the same name (see below). Emperor Alexander II gave the order to built this yacht in 1857 to the Armana shipyard in Bordeaux, France. 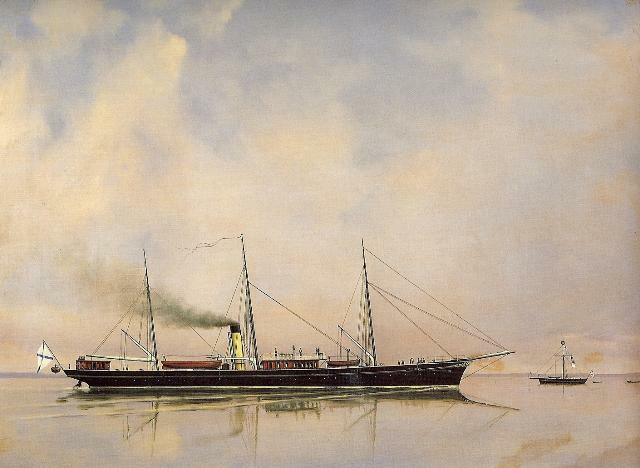 This 895 ton yacht was launched 1858 and had an overall length of 70 meter. She was decommissioned in 1892. Also this yacht was ordered for Emperor Alexander II; the New Admiralty Yard in St. Petersburg started construction in 1866 and the yacht was launched 1871. The 3,115 ton yacht had an overall length of 95 meter and her interiors were designed by the famous architect Ippolito A. Monighetti. His interiors aboard the yacht were notable for their heavy, ponderous woodwork, beamed ceilings and massive walnut and mahagony furniture in the Neo-Renaissance style. 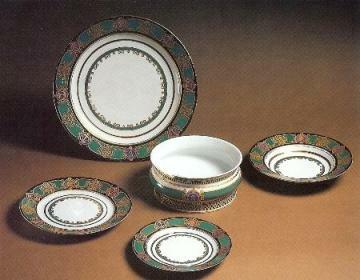 Ornaments included raised beading, carved wainscot and stamped and pierced bronze lamps, he even designed the new china service for the yacht. With the Imperial Yacht Derzhava certain design characteristics were introduced which would remain typical for all the future Russian Imperial Yachts, for instance square portholes on the main deck, Derzhava means Orb as part of royal regalia (as well as state, realm) hence almost all the artistically designed items relating to the yacht bear the traditional depiction of the orb in the form of a golden globe surmounted by a cross. 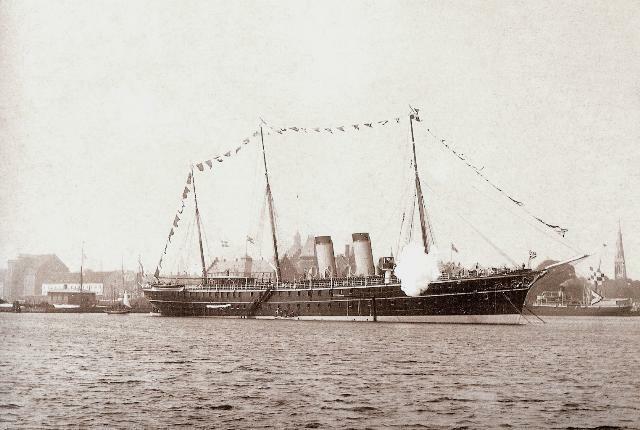 Derzhava was in service with the Garde Equipage from 1871 to 1898 and stayed the last years of her career with the Baltic Fleet, she was decommissioned in 1905. By order of Emperor Nicholas II were parts of the inventory, mainly furniture for officers and crew, of the Imperial Yacht Derzhava in 1896 transferred to the Imperial Yacht Standart. Based on a design by the Russian Rear-Admiral A.A. Popov this Imperial Yacht was built 1880 at the John Elder & Co. Shipyard in Glasgow, Scotland for Emperor Alexander II; this 4,442 ton yacht was a floating experiment in an effort to create a ship with an abnormal high metacentric height as to achieve high stability. The "flatfish" shape at the waterline gave her a very exotic appearance but her behaviour at sea was catastrophic. After the departure from the shipyard at Glasgow it took more than two months before she arrived at the Crimea. In the Bay of Biscay the ship encountered heavy seas and the passengers were tossed about as the supposedly stable and seaworthy ship lurched through the waves. Being so low to the water, the decks were constantly awash with water that invaded the state rooms and cabins. By the time the vessel reached the Black Sea, it was so heavily damaged that it had to be pulled by tugs. The constant seasickness, too, left the passengers so weak that many were carried from the vessel when it steamed into Sevastopol. An inspection showed that “Livadia” was damaged nearly beyond repair. Popov, who had endured this maritime nightmare, was overwhelmed by the failure of his much-vaunted ship; no one had thought to conduct any sea trials to determine the vessel’s stability and pitch before its maiden voyage. The Rear-Admiral sadly declared his new, proud ship unsuited except for the most shallow and calm of waters. 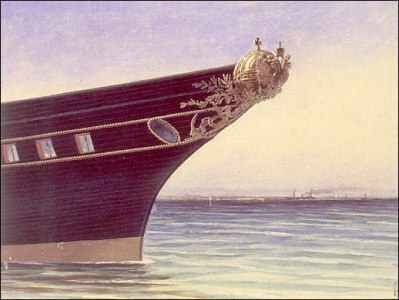 Alexander III had no use for the vessel, and it remained at Sevastopol before finally being stripped of its elegant fittings. No member of the Imperial Family ever sailed her and she ended her career as a repair ship; she was broken up in 1926. This yacht was one of the few Imperial Yachts allocated to the Black Sea Fleet. Built 1888 to 1890 at the Baltiskij Zavod Shipyard, St. Petersburg for Emperor Alexander III; this 4,160 ton ship had overall dimensions of 96.2 x 14.0 x 6.0 meters - her two triple expansion engines, totalling 7,496 hp, gave her a maximum speed of 17.5 knots. 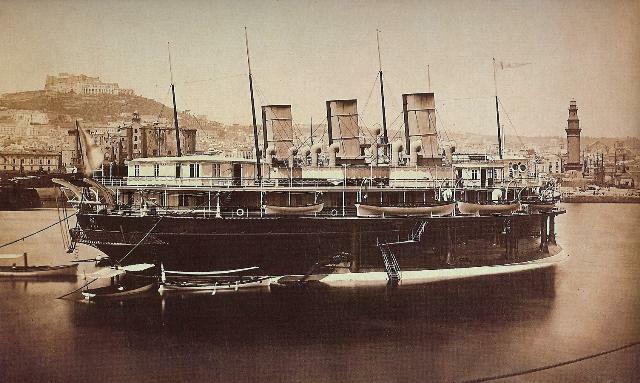 She was the largest Imperial Yacht until the Imperial Yacht Standart came into service; This yacht become more or less the private yacht for the Dowager-Empress Marie Feodorovna, who used this Imperial Yacht frequently when visiting her relatives in Denmark and England. After the revolution she was converted into a submarine support ship and survived until 1961. To replace the yacht with the same name, as mentioned above, this yacht was built 1903 / 1904 for Emperor Nicholas II; this 501 ton paddle wheel steamer was built only as to enable the Imperial Family and their guests to travel from the Great Palace at Peterhof to Kronstadt, where the larger yachts lay anchored. 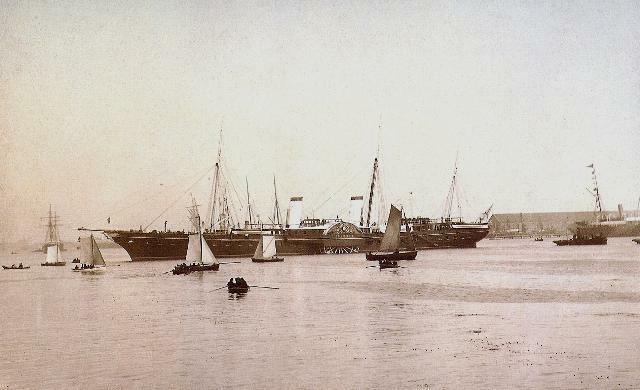 The shallow waters around Peterhof did not make it possible for Standart or Polyarnaya Zvezda to pick up their Imperial travellers at the palace quay; commuting by steam launch was considered "not done" in the case of receiving guests of State. After the revolution she was kept as a reserve mine layer and finally broken up in 1927.